I am a new owner of an IG32 with natural gray teak decks. What is the best way to care for them? Is it possible to bring the color back without damaging the grain? Has anyone tried using a cleaner like bleach or OxyClean? Or is teak oil the only acceptable substance to use? Enjoy the gray! You can bring back the honey color by sanding. However, you only have so many standings before the deck is too thin for service. Chemicals can destroy the grain and wear down the deck just as sanding does. I just wash against the grain to get the dirt off occasionally using a mild soap. I also wash down the deck with saltwater from time to time. Gray is good!!! I will second that--Gray is good. All we do is a light scrubbing with soft brush and water. In the Spring we use a little dish soap to get the dirt out. You may need to glue in some teak bungs if they pop out. Have spot caulked seams that appear loose. Other than that our 1983 IG 32 has decent decks and no leaks. Glad I cancelled the teak-deck option costing $4500. The money was better spent elsewhere. You made a wise choice, Mark! The reason I don't mess with my deck is because to have it replaced would run north of $35,000...yes, three zeros! Gray is good, indeed! Don't use oil on the deck. All it does is attract and hold dirt and wii tun blackish eventually. The only way to get the color back on a teak deck is to remove the upper layer of wood cells that have turned gray. There are two ways to do this--- sandpaper and teak "restorers." Both of them remove wood--- the sandpaper does it physically and the teak restorers do it chemically. And wood that goes away you can't get back. So if you want to shorten the life of your teak deck sanding or using restorers is a sure way to do it. There is only one "best" care for a teak deck and that is to wash it periodially with salt water and a detergent like Joy. The reason most of us use Joy is because it suds up really well in cold water. The reason you use salt water is because if any water can get down through separated seams under the decking or migrate down alongside deck screws and into the wood core of the subdeck, salt water is much less condusive to promoting rot that fresh water. If you boat in fresh water you can make your own salt water to wash the decks with---- the wood won't know the difference. We use a regular old string mop to wash our decks. This doesn't have any detrimental effect on the wood. A few times a year we give it a bit more of a scrubbing using the same salt water-Joy mixture and a 3M Doodlebug. BUT---- we go over the wood very lightly with the Doodlebug and we always go across the grain unless deck hardware prevents it. The reason to ALWAYS go across the grain is that teak is made up of runs of soft cells and hard cells. If you go with the grain with anything abrasive--- Doodlebug, coarse pad, etc--- it will "dig out" the runs of softer cells. While not noticeable at first, over time these tiny linear grooves will become deeper and the softer cells will continue to weather out faster than the harder cells. If you make a practice of scrubbing the deck with the grain, these little grooves will become crevices will become canyons. Cleaning across the grain minimizes the damage you will do to the softer cells. And for the same reason, never, ever, EVER powerwash a teak deck. I dont care how many people tell you they powerwash their teak decks with no detrimental effect, they're dead wrong. They just don't know it. Even a light setting on a powerwasher can be enough to hydraulically "mine" those uppper layer of soft cells away and you have set the stage for the eventual crevicing of the wood. If you have a problem with algae growing on the deck in the winter like we can have up here, washing the deck with a mixture of vinegar and water will help keep it at bay. But if yiou want a brown deck, you've got the wrong material because anything you do to keep it brown will remove the upper layers of wood cells and the deck planks will be that much thinner. Years ago we priced the cost of having our main deck replaced. At that time--- 1999 or so--- the estimates ran between $20,000 and $30,000 depending on who we got the bid from. Since then the price of good quality teak has gone through the roof and of course labor costs have gone way up. But that was a real motivator for us to learn everything we could about the proper care of a teak deck so we could extend the life of our now-39 year old deck as far out into the future as possible. A teak restorer example---- Awhile back I was associated with a 120' corporate yacht. The steel Phillip Rhodes-designed yacht was built in 1966 and had teak decks inside and out. Because of the way the yacht was used it was imperative that the decks look like new teak year round. Which meant the crew made liberal use of chemical teak restorers on the exterior decking. The life of the teak decking was shortened considerably--- it had to be replaced every eight or ten years---- but the staggering cost of doing this was figured into the operating budget of the yacht. 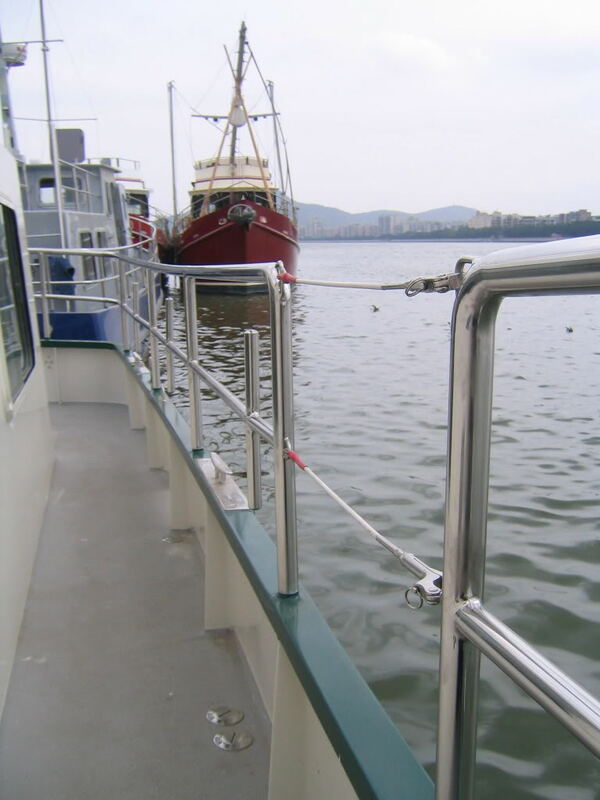 The company owned the yacht for several decades and during that time all the main decking was replaced several times. I did not learn all this myself through years of being a shipwright or anything like that. I learned it from several people who are or were very experienced shipwrights with specialties in deck work as well as a couple of excellent books on the care and feeding of wood on a boat. Bottom line--- learn to love silver-gray, don't sand it, don't chemically restore it, don't oil it, just keep it clean with soap and water. And it would be a good idea to learn how to repair deck seams that pull away from one side or the other of the groove because this is how moisture gets down under the planks where it can promote rot in your subdeck. If that happens then you can be looking at a really BIG bill. Or a really big job if you elect to fix the problem yourself. Want to note the decision to cancel the teak-deck option was based on input from this forum. Thanks! I think teak is the superior deck surface for traction, wet or dry. And with a boat like a GB the teak deck is actually a fairly major factor in the value and resale value of the boat (if you care about that sort of thing). And of course our boat came with it's teak deck so we had no choice if we wanted to get into this kind of boat. But were we having a boat build from scratch I would probably think long and hard about the teak deck option. Of course today they glue the planks down instead of screwing them down so that makes a major difference in the deck's future impact on the boat. But in your case, Mark, I think you made a smart decision regardless of where the factors your decision was based on came from. And I think your boat looks as good or perhaps even better with the deck you have than it would have done with a teak overlay deck. I think you have given me a lot of excellent advice. I asked this question to the broker I bought the boat from, and he gave me similar advice for maintaining the teak deck during boating season, but for the 5 months the boat is stored inside, he told me to wash the deck with mild soap, allow it to thoroughly dry, then oil it just before it is stored for the winter. Then wash it in the spring when launched. He said that would give the oil a chance to soak in all winter and it would prolong the life of the wood. Does this make sense to you!? Or is he wrong? I'm not sure I would oil the decks but you could try Semco. The decks are a little dark for the first few weeks after the application but they lighten quickly. We use the natural. As far as cleaning the decks. We met the captian on a 100' Swan and the decks looked great. He said they washed the decks a few times a year using Cascade (liquid) dish-washing detergent with a white Scotch pad. Probably something in the Cascade like Marin mentioned about the Joy. We do our decks with this method and they look great. From what I've learned over the years and from what others have said above, no, it doesn't make sense. It makes sense to me....sort of. Usually oil on teak collects dirt and turns it black from mold/mildew....but that's outside, uncovered in most cases. Teak is an oily wood and most wood responds well to oil. So if you are storing inside and can keep the teak clean and cool...then I see oil as a help. Worst case...you have to clean it when you take it back out of storage...but I'm not sure how an oil can hurt the teak...now how it may affect the caulking...I don't know for sure. I have teak rails that I will be freshening up with a couple of varnish coats. It is in generally very good condition, but I have a couple damaged areas that I need to take a heat gun to. How much area would you strip to bare wood around say a 3" x 3" damaged area in order to build back up and blend into the existing finish? I can't answer that with any authority because we've never done it. If you mean powerwashing fiberglass logic would indicate it wouldn't hurt anything although if you powerwash around window frames or windlass mounts or deck cleats and whatnot I suppose you run a risk of blasting out sealant or bedding compound around the edges of the joint. The only wood I know about for sure is teak. If other kinds of wood have the same soft cell-hard cell veins through it I would imagine the same risk of powerwashing teak would apply to them, too. But I don't know that so you should talk to someone very familar with the properties of different kinds of woods to find out. How much area would you strip to bare wood around say a 3" x 3" damaged area in order to build back up and blend into the existing finish? Not too much more than the area you want to refinsh I would think. That's how we do it. But bear in mind that the wood you strip back will most likely come out darker when you refinish it than the surrounding wood. Teak lightens over time even under a varnish finish. Removing the old finish and sanding the wood for new finish will remove those top layers of lightened cells and you'll expose the unlightened cells below. Your patch may eventually lighten to be lest noticeable but I don't know how long "eventually" will be. Oiled teak decking can look good; problem is how the oil affects the caulking. At least one caulk manufacturer is strongly against getting oil on it. Hard to oil the teak and not the caulking. I think I will follow your advice and leave the deck alone except for occasional mild soap and water. I also need to give the flybridge deck some attention. The gelcoat is showing wear and worn through in a couple of spots. After looking around on the Internet, I found a product called Kiwigrip for resurfacing the entire flybridge deck. Have any of you had any experience with it?